Lindsey James appreciates the counseling field, knowing that it helped her. When it came time to decide on a career, the Terre Haute resident enrolled in the master's level clinical mental health program at Indiana State University. "I've wanted to have a purpose in my career, not sit behind a desk and file papers," she said. "Once I got into it, it was exactly what I want to do." 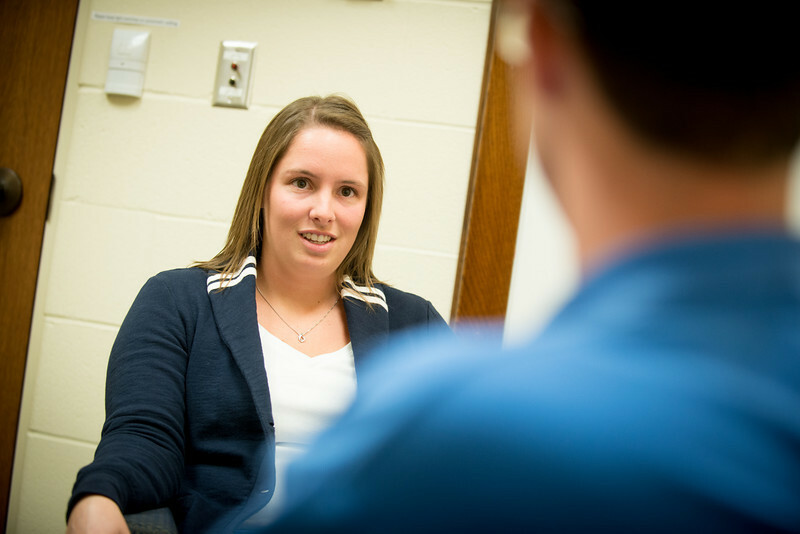 As a graduate student at Indiana State, she and other students get hundreds of hours in real world experience helping others thanks to a counseling clinic that is open to Wabash Valley residents. Clients, who range from toddlers to adults, schedule about 500 sessions each year. "It's the greatest learning experience that I've had with the program because it's practical," said Tessa Wolfger, a graduate student from Bloomington, Ind. "We apply all the skills we've heard about and learned about." During their first semester in the Bayh College of Education program, the graduates spend many hours observing behind one-way windows in the clinic. "As first years, it's an invaluable opportunity of sitting behind the glass," said Vanessa Granger-Belcher, of Troy, Ill. "We get to see and learn through their eyes." In the second semester, the students begin working with clients while being watched and monitored by licensed mental health professionals . During the one-hour sessions, the students check with the supervisor to make sure the session is on target and to seek advice. "Knowing that somebody is behind a window is working with a safety net," said Catherine Tucker, director of the mental health counseling program. "We can point out issues before they become habits. We can give ideas for therapy. If they get in over their heads, the clinician can come out and get help. Live supervision is a very rare commodity in a master's program." Many other graduate programs have students record their counseling sessions and then turn the video in to a supervisor to review at a later date. Alex Borgman, a graduate student from Batesville, Ind., said it has proved helpful knowing that someone is watching the session. "It's also nice to get some validation from supervisors who have a lot of experience," he said. "You can learn some really good stuff on the fly." But the students aren't the only ones who learn. "I think I learn as much or more from them as they can from me," said Irma Davis, a counselor with the Terre Haute Family Service Association who also works as a supervisor at Indiana State's clinic. "It allows me to get a perspective from the other side." Jennifer Smith, a counselor at St. Mary-of-the-Woods College and a 2004 graduate of the ISU program with Davis, said counselors don't often have a chance to watch others give therapy. "They all have different styles. It doesn't mean one is right or wrong," she said about observing students. "I take some of the things students are doing and take it back to my practice." The confidential counseling sessions operate as they would in a private counseling practice, with the exception of live supervision. Clients meet with the same student for therapy during the course of the semester. Clients range from children diagnosed with attention deficit hyperactivity disorder needing to learn coping skills to adults grappling with grief or depression. They also see couples and families as well as hold group therapy sessions in conflict resolution for Vigo County School Corporation students in danger of being expelled. Clare Simons, a graduate student from Kansas, Ill., said anyone can use counseling. "People can talk to someone and get out their emotions and get feedback," she said. "It's very beneficial to anybody." 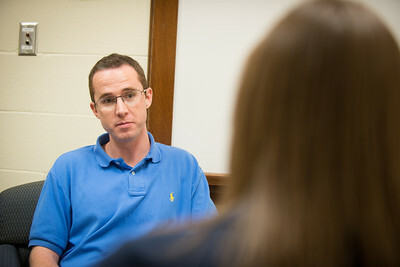 Matt Ruckman, a graduate student from Lafayette, Ind., said counseling should be a part of a person's overall wellness. "You don't have to be sick to get better," he said. "Anyone can benefit from counseling. You don't have to be depressed or suicidal." The students said it felt satisfying to help others through their issues. "It's really neat to see people who are having difficulty with things to come out of those things," said Borgman. "You're a change agent," said Wolfger. "You're helping individuals or a couple to make a change in their lives." Applications for the graduate program in clinical mental health are accepted until Feb. 1. The clinic is open for afternoon and early evening appointments, which can be made by calling 812-237-2800. Graduate students in the mental health counseling program at ISU provide counseling services to the community as part of their work in the master's degree program.